This autumn sees Damon & Naomi going out on tour to promote their new The Sub Pop Years compilation album. First off is a flying visit to Europe where they will play two dates in the UK, in Manchester (3 September) and London (4th). 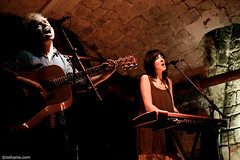 Support for both dates comes from Amor De Dias (the new band featuring Alasdair Maclean of The Clientele and Lupe Núñez-Fernández from Pipas). Then off to Paris on the 6 September. On the 18th Spetember the duo head off for a tour of the US supporting A Hawk and a Hacksaw. The full tour dates can be found on damonandnaomi.com. The Sub Pop Years is released by 20|20|20 on September 8th.